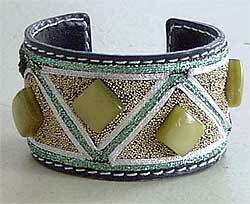 A beginner can make this trendy beaded leather bracelet in less than an hour. The secret: heavy-duty double-sided tape. It makes adhering cabochons, beads and thread a breeze (it’s so fast you won’t believe it). You can make dozens of these to sell at a craft fair or give as gifts to your friends. Lay the Treasure Tape on the leather bracelet, covering the top entirely. Remove the red liner to expose the sticky area. Lay the cabochons in the center of each triangle area. Lay the bracelet in a shallow pan and cover all remaining areas with gold or clear beads. Great but where do you purchase Treasure Tape (never heard of it)? I did a search on CutRateCrafts.com but no luck! Amazon.com has item from Dangerous Threads Biker Wristband Black Topgrain Leather 1 1/2" Wide Size Medium & they are made in the USA. The only others that I found on google were from India.